How Does Thermal Imaging In Home Inspections Work? If you are in purchasing a new home and have been looking for home inspectors to perform your inspection, you may have come across the words “thermal imaging”. Thermal imaging is a technology that some inspectors use for home inspections, but what is it exactly? Read on to learn about thermal imaging in home inspections and how it enhances a home inspection report. Thermal Imaging In Home Inspections: What Is It and Why Is It Beneficial? A thermal imaging camera shows pictures of how much thermal energy an object is emitting. Knowing the thermal temperature of the components of the home is helpful because it can show whether they are working properly, or insufficient because of damage or poor installation. If your home inspector uses thermal imaging in home inspections, then infrared images will be included in your home inspection report. These images can pick up on changes in thermal energy that are not normally visible and can alert the inspector to a hidden problem that needs to be addressed. What Issues in the Home Can Thermal Imaging Detect? Thermal imaging in home inspections can reveal underlying issues in a home such as excess moisture, overheating electrical components, deficiencies in insulation, plumbing leaks, or air drafts. If a home is not sealed up tightly, then you will waste energy trying to maintain a comfortable temperature. In the summer, your cool air will escape and your AC will have to work harder, and in the winter cold air can get in and it will be difficult to keep your home warm and cozy. 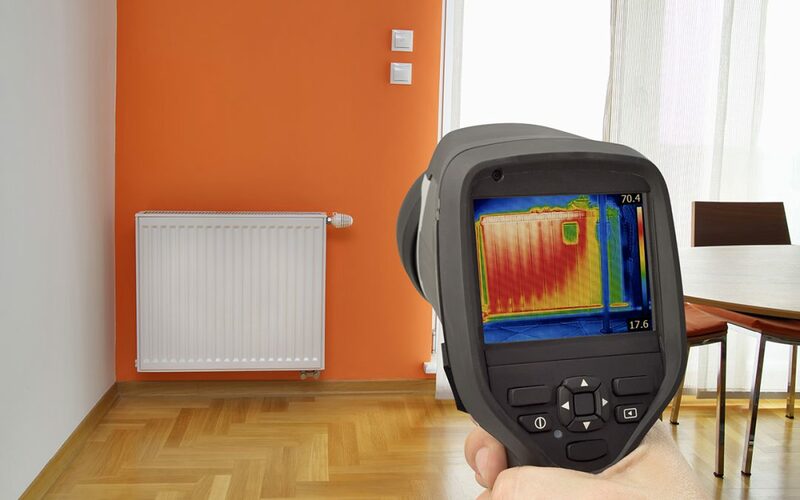 The use of thermal imaging in home inspections can shed light on issues that may be hindering your home’s energy efficiency, such as gaps, cracks, and missing insulation. Your electrical system should read as a consistent temperature when looked at with an infrared camera. If one area is showing up as significantly hotter, this is a sign that you have an electrical hotspot. Electrical issues are no joke–they could start a house fire if not properly addressed. Moisture issues and water damage are dreaded by all homeowners. Unless you have visible water stains or water coming into your home when it rains, moisture intrusion issues can be sneaky and go unnoticed until extensive damage is done. This is where thermal imaging comes into play. Unwanted moisture can show up in a thermal imaging scan as an out of the ordinary cool spot. If the home has a mold problem, for instance, thermal imaging can help the inspector pinpoint the source of the moisture that is contributing to mold growth. While thermal imaging does not allow people to see through walls, it does serve as a helpful tool to provide additional insight into a home inspection. If you hire a home inspector who uses a thermal imaging camera in home inspections, you will receive an extra layer of information in your inspection report. The point of a home inspection is to learn everything you possibly can about a house before you purchase, so it’s wise to choose a home inspector who uses thermal imaging in home inspections. HomeAdvocate Property Inspections performs home inspections equipped with a thermal imaging camera. Contact us to book an appointment in the Greater Charlotte or Lake Norman area in North Carolina.